In the first part I provided some background on the Mindflex toy and how people are hacking this to provide a cheap brain computer interface. In this second part, I look more in-depth and technical at the workings of the headset. The duel comes with two headsets; only one is needed for the BCI, so there is a spare in case things get damaged. 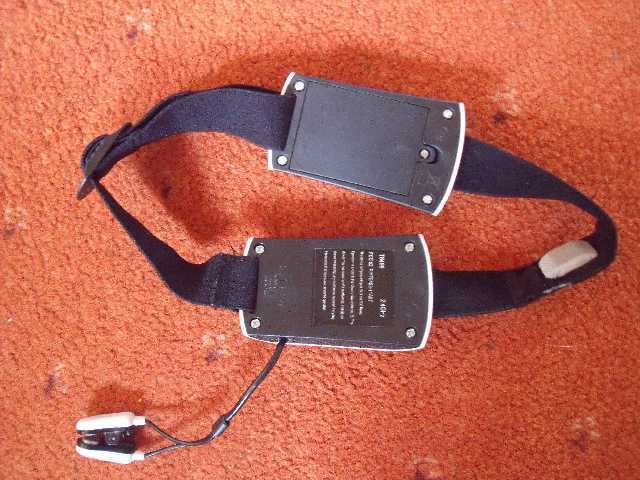 Each head set comprises a headband with integral electrode that should, according to instructions be positioned over the left eye on the forehead. 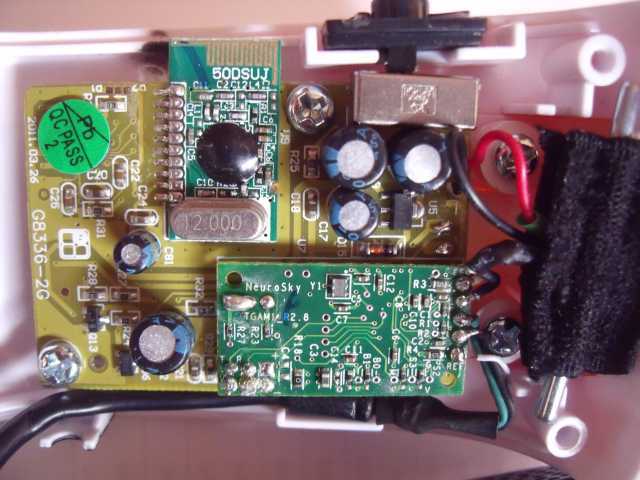 An ear clip completes the biological connections to an electronics pod that contains a special circuits and a 2.4GHz wireless transmitter to the console. There is also a battery pack (3x AAA cells) on the headband. The forehead electrode is made from some unknown conductive fabric with unknown properties and it appears is placed over what feels like a piece of contoured felt. Some how electrical contact is made to a wire or cable that connects to the electronics. The ear electrode is actually two electrodes (more about this later) made of unknown material and connects via a cable to the electronics compartment. In clinical eeg the working electrode would be silver/silver-chloride (Ag/AgCl) and the ear clip might be of the same or stainless steel or conductive rubber. The forehead electrode would more than likely have some conductive gel to improve electrical conductivity to the skin. These connections are dry, so hopefully the input impedance of the electronics will be very high. Using dissimilar metals for electrodes will result in a small DC potential existing, this could influence the machine. Also questions of toxicity of the metals in contact with the skin should be considered. There are sources of conductive fabric and ear clip electrodes available on the internet and one, if so desired could fairly easily make up a comparable headband, how safe this would be will require more work. Ions can be transferred from conductive parts in to the body with only a minute amount of electrical current flowing and there are also local allergic reactions to be considered from the materials. Opening up the electronics case (the other case contains only batteries) there are a few landmarks on the circuit board labelled G8336-2G, no info could be found on this. At top right is the on/off slide switch below this are some electrolytic capacitors and an SMD semiconductor labelled U5 and marked AA-17, this might be a regulator, no real data could be found, but it would make sense. On the underside of the main PCB is a LED that illuminates when on, it also acts as a low battery indicator and flashes when the battery is low and needs changing. To the left of the RF module and under a quality control sticker is an integrated circuit; I could see no markings on the circular button encapsulation or any identification close by, I believe this to be a small microprocessor or microcontroller. Below this IC is a transistor labelled Q13 and a 3-pin IC labelled U6, both are SMD and writing too small for me to read. There are also a couple more electrolytic capacitors in this area. At one edge there are five solder pads connected to wires to the electrodes. At the top a white wire connects to the pad labelled eeg, below this is another wire coloured black, going to the screen of the electrode cable. Below this is a green wire for the ground electrode on the ear, followed by black as the reference shield, then at the bottom a white wire connected to a pad labelled ref for the reference electrode, these three wires go to the ear clip cable. In some electrophysiological applications it is usual to have a reference and ground or common electrode, these are typically spaced some distance apart, interestingly both these are separated by the thickness of the ear lobe. 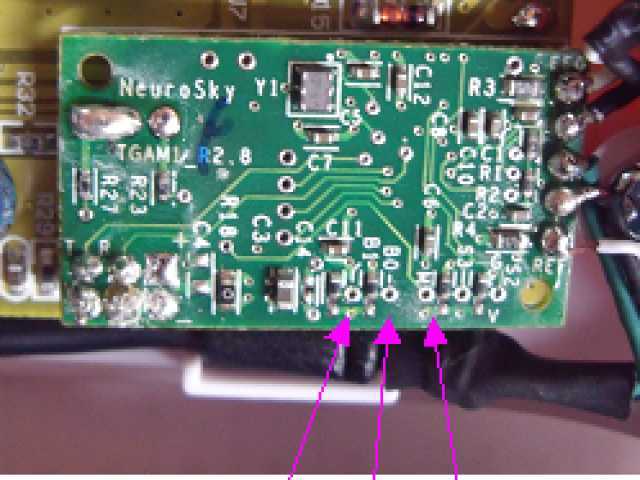 The cable screens are more than likely connected to the ground, the ref could be a differential connection to the input amplifier on the NeuroSky Chip. At the other end of the module and at the bottom corner there are four pins that solder to the main circuit board, these are arranged in a square formation. Reading top left and going right these are labelled as T for transmit data and R for receive data. The lower pair only the left is labelled as V. The lower pair are the power supply rails with the unmarked terminal being ground and V being the power line (3.3V). As indicated in the above photo, there are three links, called B0, B1 and M. The links B0 and B1 are used to set the mode of the TGAM1 and default baud rate of the data. The M link is used to set the frequency of a notch filter to either 50 or 60Hz. Reading the specification sheet does not make it clear, however looking at other information on the Internet, it appears the links are in fact 10k resistors, http://darrenmothersele.com/blog/2013/09/21/brain-wave-visualisation/ depending on what way round the meter is connected the value in-circuit measures about 1k or 500 Ohms, all are connected to ground. Another source on Internet says the resistance is 1k. The baud rate on this setting is 9600 bps (other options are 1200 and 57600), interpreting the data sheet and from information on the Internet, this apparently can be changed by sending some data on the R-pin. The default setting for the notch filter is 50Hz, there is no software command to alter this, it must be done as a hardware configuration. If required, it would be fairly easy to add switches to select the various options, so long as soldering could be acheieved. 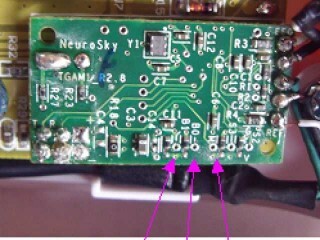 It should be possible to de-solder the 9 pins and remove the Neurosky module and use it elsewhere providing it with a 3.3V supply. Alternately these pins could be de-soldered and the main PCB removed and discarded leaving the housing available to accommodate other electronics along with the module. It does not seem possible to buy the TGAM1 module, at least as an individual wishing to experiment. The battery current was measured as approximately 14.2mA, disconnecting the module from the remaining circuit would not be too easy, it could be done. The module, in fact all modules are powered by 3.3V, the module itself according to the specification sheet takes 15mA, so there might not be too much of an advantage in disconnecting the other components. With alkaline AAA battery (capacity ~1000mAh) the expected operational hours is therefore around 71 hours. The next part of this series look at making the modifications and getting it working to display brainwave information.